Hi there! 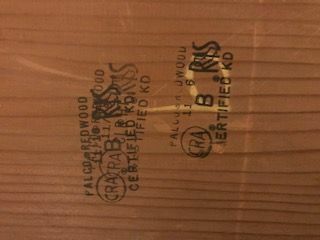 I have a piece of Palco stamped redwood. I have done research and think i know what i have on my hands but would like some help with identification. It was originally 6 ft long … 3/8”x9-14” but apparently someone didn’t know what they had and cut it in half. So i have 3ft stamped and the other 3 ft is not stamped. CRA – California Redwood Association. probably to certify the wood was harvested, processed and graded correctly. and see if there is any interest. not much you can do with 3/8” thick redwood as it is so soft compared to other woods. if it was 1” or thicker, a sign shop that does sandblasted redwood signs might be interested. you would probably get more money for it if you made a planter box, birdhouses, jewelry box out of it. just to sell the wood “as is”: E-Bay, Etsy, etc. and buyer pays packing and shipping. you would list it as “Redwood Project Board or Wood”. it very well could be a leftover board from redwood house siding or privacy fence. I just don’t think it is as valuable as you think it is – sorry. Edit: 3/8” thick redwood is readily available at most wood siding and fence companies. like pine, cypress, cedar, etc. Thanks for the insight. I want to sell it and get what its worth – whatever that it. It’s not about the $ for me, its a beautiful piece of wood and I want it to get into the hands of someone who will do something special with it. Valuable or not, it’s not everyday you run into a piece of Redwood like this and after looking up all of those Certifications and what they mean, it appears to be somewhat hard to come by. Half of those certifications are Commifornia bs. They don’t make a single piece that size worth anything extra. Like Loren suggests. list it on E-Bay with as many “tag words” you can come up with. like in the music industry for wood instruments, scroll saw intarsia art, etc. you would need several good clear photos of the endgrain, side view of the thickness, width, etc. take some alcohol or mineral spirits and wet a portion of the wood to photograph. Loren and John, Thank you. A lot of helpful information. That was exactly what I was looking for. I really appreciate it. Gilley, not sure it’s BS…. On ebay, 20 ft long, only one listed….for $7500…. no BS! Lol. When I saw $7500 for a single board I had to check that out. I looked up the auction on eBay. Are you sure that’s only one board? It looks like 776 linear feet of redwood—comprised of 7 boards at 20 feet in length, 6 boards at 18 feet in length, 33 boards at 16 feet in length. It looks like all boards are 3/8” thick and 9 1/4” wide—which seems kinda odd to me. Perhaps this is left over from a resaw operation? The grain is tight and straight (at least what is pictured)—perhaps it’s rift sawn or quarter sawn? I wonder how one can determine if wood is “old-growth”? that was normally 2×8”x12ft and laminated them into panels for signs. (so a 20 footer is not rare). so I am thinking with Bill that those are just “skins” from a resaw factory. to me (as the consumer). I guess like any commodity, it will have certain governmental regulations. Redwood from California is very strictly regulated and monitored. this would be the need for the “RIS”. there is some interesting reading on the Pacific Lumber Company (PALCO). 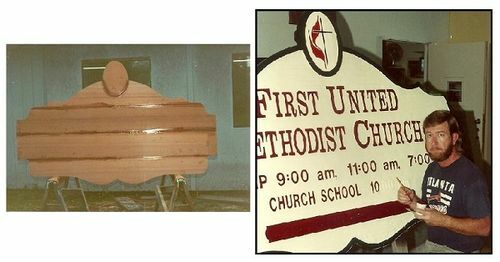 “vertical grain” is used for sandblasted signs to have a more pronounced grain pattern. or smaller projects such as musical instruments or scroll intarsia art projects. and from my experience, “old growth” has a tighter and straighter grain than “new-er growth”. 776 linear feet is a LOT of lumber !!! Here in northern California it would be worth about $20.00 max. Thanks for all the help. I’m not here to debate anything – as I obviously don’t know enough to do so. I just needed some straight forward help. I’ll keep looking. John, beautiful signs. Also, St. Mary’s in GA? 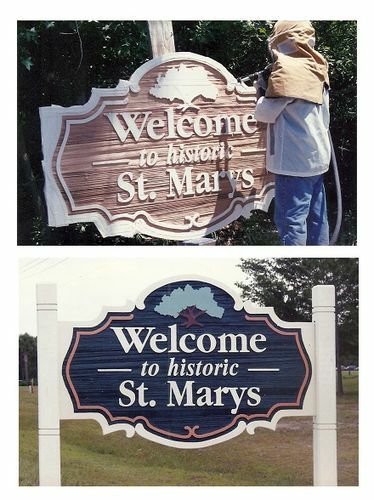 It is a beautiful place too – drive through there from Jacksonville, a lot and I’m sure I’ve seen that Welcome to St. Mary’s sign. Yesterday I took the pieces to a place here in Jacksonville that I found, called Woodcrafters. They did some research for me and a couple of the men looked at it and said that it looks like what I have runs about $375 a ft. Be nice to get a clear answer but seems like my best bet may just be to hold on to it and appreciate it until I the good Lord helps me see what to do with it! :) After all, it was my Grandfathers. A long with Purple and Yellow Heart. Some beautiful pieces but those two were much easier to identify and figure out! I hope you get the price you want/deserve or (maybe better yet) make a lasting keepsake out of it that will remind you of your grandfather and brighten your day whenever you look at it. I’m always amazed at the prices that rare and/or highly figured wood commands. There’s a website called Northwest Timber where you can buy all sorts of figured lumber that is just incredible. I can’t afford any of it but it’s still fun to look.